The May 1st issue of Booklist, a library journal devoted to book reviews and recommendations, featured mysteries and included some really good recommendations for online sites for mystery readers. I thought I would share some of these with you. The Malice Domestic site is dedicated to mysteries that are traditional and “cozy,” as the site’s subtitle “If traditional mysteries are your cup of tea…” alludes to. 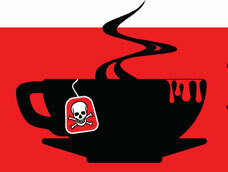 Malice Domestic provides all kinds of information about their annual convention (next one – April-May, 2011), but also lists all the Agatha Awards given out (since 1988) and is a fun site to just explore. The Mystery Writers of America give out the annual Edgar Awards (and have done since 1946!) and their site contains information about their organization as well as a complete archive of all the winners and nominees for the Edgars. For a site that tries to pull all of this together - listing award winners and nominees, new books, old titles and much more (over 37,000 titles) try Stop You’re Killing Me. This is a wonderful site for mystery lovers. A very unique Stop You’re Killing Me feature are the indexes. They have an historical index (find mysteries that take place in the Colonial era), a job index (find mysteries that involve an interior decorator), a location index (find mysteries that take place in New Mexico) and more.